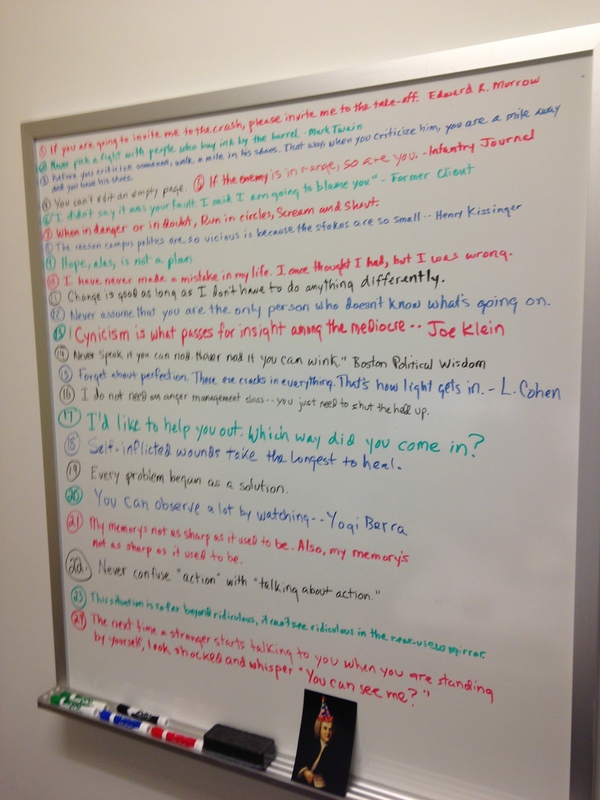 For the last several years, I have had a white board in my office on which I have written a number of adages (currently 24) that have come to mean something to me over the years. The list changes now and then, with new entries supplanting older ones that have not aged as well as I thought they might. So at any particular moment, it’s a work in progress, but I thought I would examine a couple of items that have endured. The first item on the list — always Item 1 — is a quote from Edward R. Murrow, the legendary newsman who pioneered broadcast journalism. For many corporate communications leaders, this plea has great resonance. Firefighters will tell you that they would much rather prevent a fire than run headlong into one. Too often, the PR team gets a call after the flames are licking the rafters or, to use Murrow’s analogy, the plane has begun its downward spiral. No matter how nimble the response, damage (and perhaps disaster) is inevitable. Obviously, the sooner the PR team knows what may be coming down the pike, the better the chance they have to mitigate its impact — or even eliminate the impact. It’s possible that running a planned action by the PR folks for their opinion might cause management to rethink and possibly abandon that plan before somebody gets hurt. Item 19 on my white board provides a clue as to why this strategy is ignored too often: “Every problem began as a solution.” By definition, most people are blind to unintended consequences. What seems like a perfect and elegant solution to a problem may instead create an even bigger problem. But often, they can only see the upside of the solution — “No need to run this by the PR Team. I mean, what could go wrong?” Entire careers in crisis response have been launched with those words. Item 22: “Never confuse action with talking about action.” How many meetings have you sat through wherein the only achievement was to schedule the next meeting? Too many, I have no doubt. Try not to end a meeting without gaining agreement that somebody in the room will embark on the expenditure of ergs. Reserve five minutes at the end to create a to-do list and assign responsibility, as well as building in a reality check at some intermediate point before the next meeting to make sure there is adequate progress being made to warrant getting the group together again. Start the next meeting with last time’s to-do list as the agenda. Watch your meetings get shorter and more productive. Last one, Item 3: “Before you criticize someone, walk a mile in his shoes. That way, when you criticize him, you’ll be a mile away and you’ll have his shoes.” No explanation necessary. Chris: I’ve always collected quotes, so this post is very interesting. Thanks for reminding us to pull out our quotes sometimes for inspiration and motivation. While digesting the deep significance of this statement, a good friend turned to me and said that in reality the difference was about £75 grand. Ha! Your friend is right! Chris, these ring so true and sometime very familiar. Have you added another famous Geoff Nightingalism: ” if you take care of the inside, the inside will take care of the outside. “. Can you have them printed out? I promise to reciprocate. Regards to Lauren.